I think there is no possible answer in canon, and any solution could be good as each DM prefers. I try to make the map as canon as possible (while still adding all details canon and fanon and removing flaws). The issue is as far as I see that the Nithians first came to Oenkmar (which was still stuck way up in the Shaft of the Volcano--i.e. "on the surface"). They (canonnically)made structures/settlements there ...though in Oenkmar canon map none can be found, so I presume these are in the surrounding(on the Plateau??) . There are also dwarven structures in the area of the same era. Am i right or not in this assumption? Gnolls canonically were created by the Nithians (but where?? ?....in Nithia?? or as i suggested in Oenkmar?? ( using the Shadow Elven Magic located in the Great Temple (this probably offended Atzanteotl, who desired to have this magic for his current followers the Humanoids)). Later when Nithia dissapeared the Gnolls founded Gnollistan. But were they already here, adjusted to the Nithian style, or did they just arrive (or both)?? Though work lazy as they are, the canonnically say (LIE i think) that these were made by them (and maybe they worked on them as a slave, but actually never architecturally gained the ability to create such structures) but in fact these were Nithian (and even Dwarven Work). Or did they have the ability to create these themselves...then why don't they do this anywhere else?? Last edited by Robin on Tue Sep 27, 2016 11:46 pm, edited 1 time in total. Robin wrote: , but still many flaws remained, were ignored or newly created. Especially the Mapping ...And that is easily done . http://pandius.com/west_broken_lands_un ... 8fussl.png that we both made the same flaw as the original mappers. As there were no altitudes on the maps, (except only a few Broken Lands, and these were flawed as seen to normal water flow), we both worked on the Crater without actually knowing how high the surounding areas actually are. As of I now have corrected the Glantrian Red River(amongst the whole region), with a normal flow rate and altitude correction, and thus have deduced the normal height of the region, which is much higher than those we assumed for the crater initially. (probably our original estimations were based on the flawed Broken Lands map altitudes). It is best to use the -2300' lake surface in the Crater is correct, but the Crater's edge must be higher than the normal area. If the edge of the Crater is at 4000 about, and using the technique of Sean Meaney's map who did not use any other altitudes than the Lakehttp://pandius.com/New_Kolland_1mile_hex.jpg by making a rise directly from the edge and then lower to the existing height..a sort of hump. Which is logical when seen to existing craters. crater-->edge-->pushed/dumped material-->top dumped material, ---> natural area pushed up--->natural area intact. The edge itself at 4000' is thus sharp going down almost 90degrees, to about 0 feet altitude, deepening further to the lake surface at -2300'(the lake itself will have a undeep middle (the crater remnants) and a deeper ring around, of estimated 100 to 200 feet depth. The humped edge goes thus from 4000'to 7500'(averagly) in a 45 degree angle and then goes down to 6500 feet the normal average in the same reversed angle (somewhat like the angle of repose) https://classconnection.s3.amazonaws.co ... 449922.jpg. Last edited by Robin on Wed Sep 28, 2016 4:21 pm, edited 4 times in total. Robin wrote: Gnolls canonically were created by the Nithians (but where?? ?....in Nithia?? or as i suggested in Oenkmar?? ( using the Shadow Elven Magic located in the Great Temple (this probably offended Atzanteotl, who desired to have this magic for his current followers the Humanoids)). The hypothesis by Chimpman, which I also used in my article "Past Ages of the Known World" in Threshold issue 12, was that Oenkmar had a powerful empire at the time of Nithia, and the two were rivals. So if there elaborate structures and pyramids in Gnollistan, they should IMHO predate the gnolls and be Oenkmarians rather than Nithians, id est inspired by Azcan, Elven and Mogrethian (Lizardmen) architecture. In fact before the Broken Lands were created by the 1700 BC explosion, they should have been inhabited by several races, first Carnifex and lizardmen (and probably also troglodytes), then by humans and elves (Blackmoorians and ancestors of the Belcadiz), then by fairy folks and giants after the Great Rain of Fire (Grondheim), and Oenkmar in particular was also inhabited by the Azcans, which had the city until 1500 BC, when the ancestors of the Shattenalfen arrived. Then the humanoids had the city from 1190 BC. All this obviously is mostly the elaboration of canon informations that the fan community did over the years, rather than stricly canon. I already interred your works of Oenkmar Empire. So I do not think it is be Oenkmarians rather than Nithians, id est inspired by Azcan, Elven and Mogrethian (Lizardmen) architecture. Could it be that these Nithians were Renegades, traitors, other faiths (I think of Horon(aka Ixion)), who fled the negative Nithia and settled here...until they were withdrawn from Mystara by the immortals , ...but thus giving legit reason for Nithian Structures used today by Gnolls after the original Owners were gone, remaining behind. Especially as Stone Giants live nearby (west of Dwargate/east of Gnollistan), and the notation that some dwarves also settled here. This together feels much better. Oenkmarian agents succeeded in pushing them to rebellion. The Oenkmarians then guided them as advanced troops against Nithia itself, Traladara and Sind. Some (Canis erectus Hilaris)heading westward to the source of guidance, found South Gnollistan in the eastern Broken Lands, south of the Streel River between Kol and Yellow Orkia (with the familiar Nithian structures they were originally forced upon to build or serve within), now gave them a feeling of prominence, and importance (hence the now refuse to work, and use slaves themselves). Thanx Sturm this gives way more sense , and a refined source of detail I can infuse in the 1 mile map in Gnollistan. Bugburbia; Bargazhi and Trammelant both originally Elven structures from the Realm of Aengmor. High Gobliny; Fort Akkrass, It is assumed to have been the ancient city of the legendary Troll Queen, heavily overbuild, but still much can be discovered. High Gobliny;Plateaux of Zyrd. Remanant if the Earlir culture of Gobbleton and another unknown racial legacy. High Gobliny; The Skull of the Dragon King. this relates back to the Dragon Lord chronicles. The Mucks; There is an ancient ruined town here from the Blackmoor era, its name forgotten in time, marked with a orange dot. The Mucks, Yellow Orkia, The Wet Vale (Valleyy NW Dwarfgate Mountains), Ethengar; The Vessel of Steel, Vessel Ruins all date from the Blackmoor era. in the real world, there came a change in water vessels upon the discovery to create ships of steel. These, often much larger and offering much more space, vessels rapidly replaced the wooden vessels. Engines running on different kinds of fuel, powered these vessels, most popular amongst others was Radiance magic. But when Blackmoor was destroyed in the Great Rain of Fire, there was no more energy produced. All engines exploded in the blast, and the few vessels that drove on petrol fuels, stopped working as soon as their fuel ran out. The Vessel of Steel in the Mucks is an example of a Radiance vessel. The Mucks; The Troll Houses; These Domes constructions were actually housings for sentient water creatures from the Blackmoor era. The Mucks: The Giant Head There was a time when this region was under the Rule of the Grondheim Giants. These had settled themselves in the Colossus and Dwarfgate mountains around 2300 BC. Why they disappeared is to debate, but one of their Storm Giant warriors waded through the Lake Grondheim, when the Troll Queen decided he was an invader. She called forth her charmed Medusa, removed her helmet, and sent her in the swamp. Indeed the two did meet, and battle and it soon became clear that even the Storm Giant was no match for the petrifying powers of the Medusa. Up to this day, his stone body stands within the muck, washed over by the flooded lake, sunk partially within the bottom. Stone Giantseveral old marks of the past are found between Gnollistan and Dwarfgate south of Yellow Orkia. Thus according to all info we also have; Gnollistan holds Nithian Style Structures, and some Dwarven influences or structures. The Nithian Structures were thus created by Nithian Followers of Horon (a Lawful Immortal) hence organized, and regular. Like the Old Necropolis, The Black Pyramid and the Nithian Style villages. 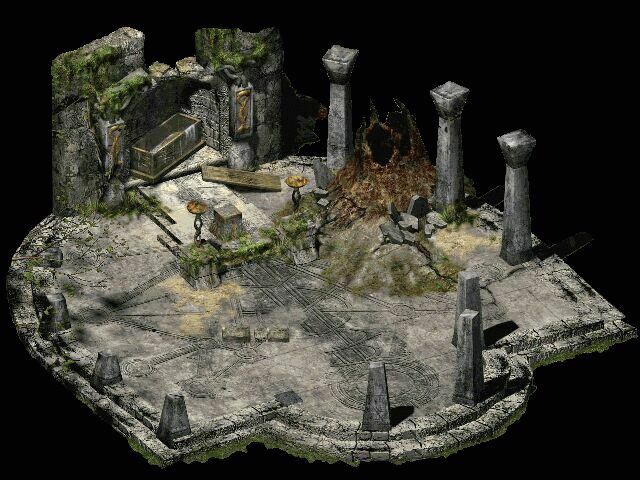 The chaotic New Necropolis would thus be Gnoll made. The Gnoll Kings Tomb, was probably intended for the Nithian King but they dissapeared before, and thus was used by the Gnolls instead. All are to be found on the surface map thus far. Troglodytes erected more instable structures and together with the geological changes most other sources from any origin have long be eroded, plundered, looted, overgrown by nature or covered in magma, dust, or fallen rocks. Indeed, and the good thing is, there are many more (but more recent). 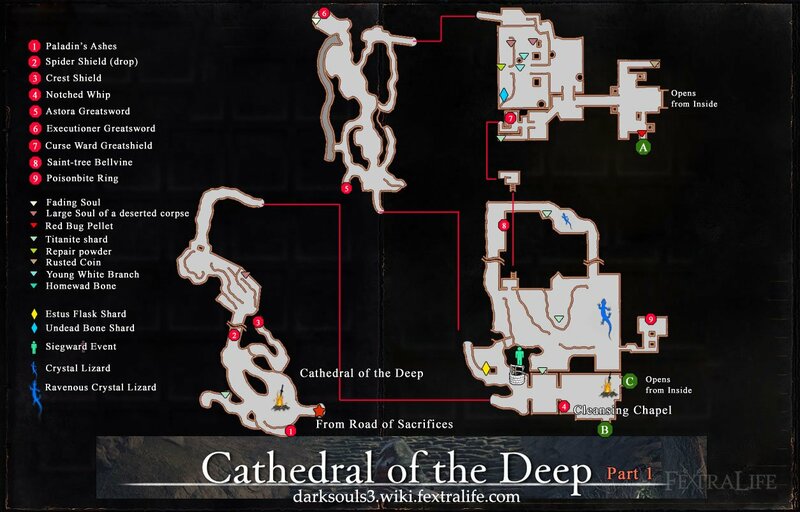 Ardelphian ruins & locations, Broken Lands secrets, and much more. I feel slowly if by making my 1 mile map, the Broken Lands suddenly spring to life. Btw the Blackmoor Ruins I drew from the 3050 BC New Blackmoor maps I believe you worked on? Anyway, some of these locations still exist.Though tuined beyond recognition (often only foundations) but who knows what is buried in the ground/remains of 4000 year erosion by weather, geology, nature and plunder. Yes, I draw it for Threshold issue #2. The First Completed description made due and from the creation of the 1 mile maps. Thanx to all contributors. Abandoned ruined city, Most farms nearby ruined. The city was probably highly trade-oriented and artistic, but its proximity to the Broken Lands would have required a strong military presence. It is also mentioned as having been a competitor to Corunglain. The city once had a legendary temple to Asterius that boasted 336 bells - one was rung for each day of the year. After the city fell the golden bells were of course looted, and remnants of the House that founded the city have sworn an oath to recover as many of them as they can. The Temple is the central one on the Map. The other tower structure is a former mage tower. He had several students. The city had underwent a few stages in development, the central part, with its concentric redirigated water canals and simple wooden walls were the first city borders and defense. The City of Ardelphia later became a great metropolis of multiculturalism compared to the mud hole of Braejr, and as thus expanded greatly. New canals, defenseworks (sort of earthen forts) and city walls (earthen walls on the outside of strurdy stone walls.) were added. The Mage tower came to be. The other important buildings (bleuroofed in the map, were a cloister (East), Military school (South West), Merchant Chambers (somewhat like the great Darokin Halls) are South East, On the Market, the small stone structure was city Hall, Nothwest was a well known Tavern, larger than many current taverns., North was something Glantri was angered about, a Public Library...how denigrating, to let commoners enable to learn, study or even read. The small templelike stucture was a building know as "Shrine to any" here shrines to many good immortals could be found, and it was this that enabled Ardelphia to become a cultural melting pot. If you behaved, paid your taxes, did your dues, you were welcome. Vagrants, beggars were however sent outside the city walls. 846 AC: Orc horde from the Broken Lands loots Ardelphia, utterly destroying the city.” (GAZ11 DM’s Guide page 6) Trouble with the orcs was at a minimum during this time, with one notable exception. The northern town of Ardelphia was looted and leveled by a huge army of orcs crossing the border from the Broken Iands. Fortunately, the orcs quickly fell to bickering among themselves over the booty, and the army disbanded and returned home without causing any more damage. With the fall of the city and its military, the nation fell too, many fled to other locations, and left the place for the few who dared to remain behind. Today 1014 AC Ardelphia is a ruined city, the stone buildings still exist, but are greatly damaged due weather effects. the wooden and half-timbered houses are the worst, less than 25% is still standing. There would definitely be more ruins nearby. Drawing on the old lore (Daelbar et al), Ardelphia did exist as a petty state for a time before being re-absorbed into Darokin, and then ultimately being destroyed. These states didn't always co-exist peacefully, so it would be logical to assume that there were fortified border posts (towers) and the like. There would have been such a post between Corunglain and Ardelphia, and one with Daelbar - so there are two ruins for you to add. I could see one of those old border forts now being occupied by highwaymen/brigands. Surviving villages (there would be a few) would be self-sufficient, or would trade amongst themselves. There might be an apple orchard or two, but probably not vinyards (although there may be a forgotten estate whose vines have now grown wild). Vines would have been cut down and replaced by root vegetables, or wheat - anything with solid food value. Herding - sheep or pigs, probably, would be common. Goats would be common, too, because they can eat anything. The people in this region are survivors - their city was destroyed, and they were basically left to fend for themselves. They are probably very close-knit, and keep close tabs on their neighbours, but strangers who act in a remotely threatening way are probably killed. there would have been some mining activity around Ardelphia - enough to ensure artisans didn't buy all their precious metals from Glantri, and quite likely there would have been mining of base metals like tin, lead, or copper. Some of the mines would still exist in the mountain spur to the south, and there would be at least a trail (or part of one) running from those to the ruins. I think it's also quite likely that there would have been a hamlet or small village in the long valley south of Ardelphia, right where the three rivers meet. Carts laden with ore would have traversed the rivers at that point, so there would have been a bridge, and the hamlet would have grown up around it. Some artisans might have set up shop down there to get first pick of whatever came out of the mines, too. It's possible this village could have survived the destruction of Ardelphia, but without the city to serve as a market a lot of people would have left. Now there would probably be an inn for the odd traveller, a market for the farmers who live in the valley, plus a smithy and a few basic amenities. Plus a lot of abandoned and crumbling buildings. On the topic of megadungeons, It has potential to be a megadungeon, or at least the center of a megadungeon sort of campaign. On the first level, you've got the ruins of the city up above, which would populated by all sorts of humanoids, monsters, and bandits. Beneath that, you could have the city's old sewer/drainage systems, possibly even some former areas of the city that had been built over during the centuries of Ardelphia's growth. Beneath that, you'd have caverns linking to the Broken Lands and Glantri, populated by humanoids, and even further, you'd have the Shadow Elf caverns. I've long thought that a "reclaiming Ardelphia" sort of campaign or mini-campaign would be cool (and even alluded to it in one of the Almanacs). Given what is now known about Ardelphia, specifically that it was overrun from below, any reclamation would have to take steps to accomodate that possibility this time around- which would require anything from clearing out and setting up permanent underground strongholds at strategic cavern points, to possibly allying with shadow elves (who are in a strange "enemy or ally?" status post-WotI and their "reveal" to the world) to keep out humanoid incursions. Or else getting dwarvish allies to set up below, etc. This site was the magical location were 13 Erewan Elven mage knights turned to use witchcraft in the age of Ardelphia. Experienced enough to be a knight in some unknown forgotten obscure order. These elves were more interested in power and witchcraft than in righteousness. In effect they all behaved like Avengers but without a religious base. They did however create the Bladed Cathedral,with magic and workers, but even today rumors speak of the horrors the humanoid and human workers had to forcefully endure to create it. Even the Ogremoor Ogres disdain this place. And though the local populace was devastated by the humanoid attacks in 843 AC, these “knights” did nothing to help them. Instead they went to battle the humanoids, and acquire treasures, but all for themselves, not to help the poor. They even commanded the complaining people to be hung. Many of the Ardelphians fled south into Darokin, while others went to the Bladed cathedral, hiding in fear, where these knights should have helped them. They never did, and never came, and one by one waiting for help, the refugees of Ardelphia died, and it is these souls which torment the knight to this day. Haunting their dreams, tormenting their thoughts, harassing their feelings wherever they went. Every year they reconvened here to find a solution for their “problem”, at the same camp location they did before; where the complaining commoners were hung. In 1010AC they discovered that their former camp was actually a magical location like the ones in Alfheim. Though not as powerful, their thought was it might be a resolution to get rid of the troubling souls. As they did create a Witch circle, they released a powerful surge of magic, directed at the old Bladed Cathedral. Where many of the dead they caused were laying around, the magic drew the Knights within. Unbeknownst what they summoned, the power they hungered still with their greed, they entered the Bladed Cathedral, they themselves erected in those days of bygone time. How experienced they were, they one by one died by the horrors they unleashed. In Limbo their souls were stripped to shreds by the souls of the dead who waited for them to come. And with each death a taunted now evil soul reawakened the old thoughts and entered the dead body of the witch Knights, restored them to a sort of unlife, a vampire. Capable of using weapons and magic, these elves turned evil and became vampire witch knight. Their thoughts were still not calmed, and it needs a group of new heroes to bring them rest or more people will be hurt. DM Info do not read if you are no DM using this!! ; Now they are under control of Demogorgon, an entropic evil immortal, rarely heard of in D&D current times, but in history its name pops up regularly. A single large underground temple-like structure. almost used like a city, with inside a huge sarcophagus. This is based on the Dark Souls game. 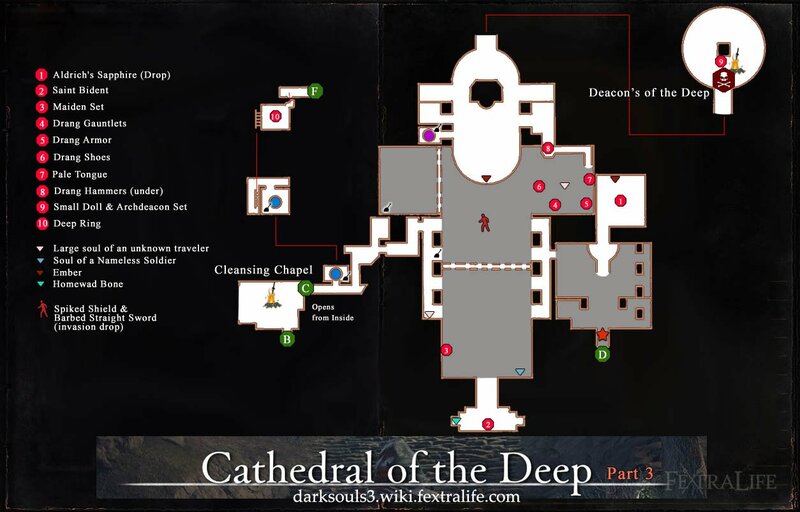 The following maps are very usable, but best is to add your own undead content together with the 13 witch knight vampires. DM Info do not read if you are no DM using this!! ; These 13 vampires start roaming the area to accomplish their goal. activating the Shoggoth Stone. This stone is deap within the Cathedral, inside the large sarcophagus. Guarded by not only the well experienced elven vampiric witch knights [level 12, 13, 14, 15, 16, 17, 18, 19, 20, 21, 22, 23, 24, 25, all 12 HD vampire, with each two weapons at masdtery level, and all witch spells, and skills(including casting unmemorized spells from a cauldron or book, as often as desired--normal casting times do apply)}, but also by other undead, minor vampires (recent victims), charmed Ogres, and constructs controlled by the demonic force responsible for creating the Shoggoth Stone in the first Place. This is an old area known before the Ardelphian era, and was used to inter the dead. The last dead interred here were several hundred victims of the war on Ardelphia in 843 AC. The great geological changes in the area, however, made sure no floor is level, and damages are great. Several restless incorporeal undead reside within, but great treasures of bygone times may be found. It is here where weapons are stored which could be of great use against the Vampire Knights of the Bladed Cathedral. Tredamay is a Cleric/Loremaster, an albino with long white hair and red eyes. A party seeking help from Tredamay mistook him for a vampire, and broke brother Tredamay’s concentration during a vampire exorcism upon one of the Vampire knights of the Bladed Cathedral , which led to an attack by the vampire. The vampire escaped after tuning invisible. Brother Tredamay told the party of the Shoggoth Stone which is the source of chaotic energy that twists the laws of nature. The Shoggoth stone is able to place the region in eternal darkness ( a Continual Darkness of 50 miles diameter, unable to dispel in any known way), enabling the undead to rule there and then. When the stone is removed with the aid of the Staff of Rightful the eclipse will be lifted. The staff is located in a tower which as not been identified by Tredamay, and heroes must find other ways to locae it.. Why??? Because these Half-elves of Fenhold were very Righteous but treated wrongly. The use of the staff and return to the Fenfolk will clearly help them in developing their own voice and identity, so long denied. The secret Immortal responsible for creating this artifact (which in effect can create a single burts of Continual Light 50 mile radius, together with a Bless effect to the Righteous, and blight undead within the area of effect), specifically did so for working against Demogorgon. Along Good Trail To Fort Fletcher, and simple trail to silver, Electrum, and Steel Mines. Nearby Northern simple Trail Through Detwillon Pass. Cumar Creek, Streba Creek, Orthas Creek Detwillon Creek, Sasha Creek, Boron Creek, Ardelphian Creek Fletcher Creek and Shalander Creek convene together into the Ardelpian River. Streba Creek Crystal location; These crystals disable Summoning and Conjuration magic in the area, but increase Illusion spells to make them almost real in any aspect, these can't be disbelieved. An illusionary house of an illussionary witch was once summoned by a witch within the fork of the Cumar and Streba Creek, as a copy to prevent the humans from hunting her, and it still exist today. this illusionary witch even thinks she is real, but when ever leaving the area she will be dispelled as normal, never to return, just like any creature ever created this way. Imaginary tools thus can be used, to dissapear outside the area, but not the effects created within the area. for example an illusionary axe kills an oponent. he dies by the wound, outside the area he will no longer have the wound, but is still dead. a Real wound is stitched by Illusionary tools. Outside the area the wound is closed, but the stichings are gone. The crystals growing in the pass are large bush aloe like shapes which only shed a soft green or purple light 30' radius, illumination great sections of the pass. The light of a broken off "leaf" stops after 3 Turns, the source itself is continuous. The mines is this area date from Ardelphian era and were abandoned soon when the effects of the Tempus field became known. The Hill Giants of Bihiya Creek about 400!! in different caves. non aggressive (as of yet), neither territorial, but hunt/forage in the whole area. This was some sort of tower, from the Ardelphian era. Its use forgotten and not to be known from the ruins. Nearby Crystal location; these very fine snowflake-like crystals were used in creation of magical weapons and armors in powdered form. the area has grown after centuries of non harvesting, and is now nearly a half a mile across. It has NO magical aura or other effects. Erdubar 3550'Gellubar 5125', Gombar 6000'Former residents 150, 350, 500 All abandoned dwarven mining villages. Also hired as architects by Ardelphia. Delmar 2475' This ruined unknown structure could have been an Ardelphian fort, castle, or village. It was too large for a single tower. As according Darokinian Files there has been a fortress/city in line of defence against Corunglain. There are some reports of minor skirmishes, but nothing which could lead to becoming a ruin. Another explanation could be the Glantrian Plague which did also spread here.Some Shadows are regularly sighted in this region. Both are still in use, now being occupied by highwaymen/brigands in the one near Roneth and regularly vistited at Caldenhill. Since the unification of the several minor nations into Darokin, these actually lost the use, except in the case of humanoid attacks. This region is superheated by the small downstreaming middle magma tunnel in Lower Broken Lands. adjusted from Source Gecko. Here Drake Brown battled the Ogres with illusions. Use canon information in Gazetteer Darokin. A forgotten magical artifact they forgot to turn of, so every full moon is visible, the portal will be opened, destination ; the same, Time destination: unknown, but at least after the gate was created. Glantrian mages banned for their dangerous practices and seeking asylum in the Free state of Ardelphia, they continued their interesting fascinating and dangerous work upon natural Crystals. These rectangular hexagonal crystals grew with water and could be shaped into an arched bridge-like eddifice, Together with some powerful incantations, the magic of the crystals was released upon the arch (which looks with its reflection like a circle), and its magic became known. The 3 mages soon dissapeared. The gate was finished 12th Yarthmont 842 AC, just a few years before the destruction of the citry of Ardelhia in 846 AC. The gate still exist in 1455 AC, as some timetravellers found out, but in bad state, erosion took is due, and it is estimated the gate will not exist for very long. As thus it is estimated that Time travel can be between any of these dates as long the bridge exists. The travel goes both ways, but only on days the full moon is up. DM Info do not read if you are no DM using this!! ; To be able to return to your reality, you may not change anything, only look.Minor changes (footsteps, eating, talking to someone without giving ideas, personal magic, buying items were more exist, etc).will not affect your reality. DM take care. A great adventure through time could be that the mages must be retrieved in time, where the request comes from a young boy and his teacher, this boy could be anybody; a younger mage gotten older in the Tempus field or the teacher could be the sameindividual, travelled to an earlier time...imagine your own twists. together with the happenings in Ardelphia, the Tempus Field and the temporal gate could lead to a nice series of adventures. Addition; http://www.pandius.com/thhoth.html This speaks of a terrible horrible dog-like monster of incredible size; The Hellish Hound of the Highlands. Its existence in the West of Ardelphia is surely a restraint in its development. What it actually is no one knows for sure. When looking upon the Art, it seems to resemble a Leucrotta, which was also used in earlier D&D pc games(in the time AD&D2 did exist just recently--I have the game somwwhere but forgot its name...its ancient, but was fun; Leucrotta's, Ettins, Faerie Fire, in a region surrounded by Mountains, and some names were used then and later became Darokin names) , or indeed a giant doglike monster (or even a pet from the Cloud Giants living on the Silver Sierras West of Ardelphia. Whatever the creature indeed is, it lives mainly in the corner between Ardelphia River/Creek, Gate Creek, and the mountains. There are high up the mountain several caves where these creatures may reside in, and hunt in the lower hilllands. Last edited by Robin on Sun Oct 16, 2016 1:59 pm, edited 5 times in total. Both these ruined settlements are ancient and predate the Broken Lands. Both were settlements of the former Elven Nation Aengmor, like with Trammelant and Bargazhi in Bugburbia. Like there, the names were corrupted, simplified. Current K’blam was originally Kabla-ám; Ka= Cause, Bla=A lie, Am=going Up, Translation; “Because a Lie goes up”, meaning; A lie will be revealed. Why this peculiar name is unknown, but the Orcs discovered many Detect Lie scrolls and items, they sold to greedy merchants. Likewise the source of the settlement can’t be discerned anymore; It is unknown if it was a temple (what is suggested by explorers), a cloister-like village, or a normal settlement. The orcs who discovered this location earned a great amount of money, weapons and food by selling what they found here. Much of it seems to be now in the hands of the Great School of Magic in Glantri and various mages all over the Known World. It is rumoured that many underground locations are still intact and could hide Elven valuables, knowledge or magic. Elfbones, originally called Saimartha; Sain=New, Marta= Chance, Translation; “New Chance”. This strange location was even at first sight, clearly an Elven village, the plant-like design can be found everywhere, tree branch patterned roadways, decorative pillars, stairs, ledges and what not. Everything is made of the nearby mountains in those days, and not like the K’blam, Bargazhi, and Trammelant, created from cut stones in the region itself. Hence it has a darker and sturdier feel. Traces of paint reveal however, that everything was coated in a silvery-white color, with green and gold plant-like patterns, all long gone after centuries of decay and erosion. It were however NOT the Humanoids who discovered this place, it was a small group of Erewan Elves, and they decided to settle here in 770 AC. Soon other Elves set up simple wooden settlements between the ruins of their ancestors. They discovered its ancient name Saimartha, and named their new village as thus, stating to investigate, clean and restore the old stone structures. Near Lake Dromm Orcs had already settled, and they greatly dislike the presence of Elves on this side of the River. Karrwux, a powerful and rare literate Orc Shaman, investigated several scrolls, book and other scriptures, plundered from Glantrian mages. He discovered knowledge he saw as a direct mean to get rid of these pointy-eared pests. He started the rituals he saw needed, and soon the power of the incantations did indeed summon something. It was a tall, very tall, absolutely dark black giant; A Nightwalker. It is unknown what happened next and in which order, but both the orcs and the elves were destroyed, many flattened corpses were lying around. The Orcs, who succeeded to flee, soon returned and created the keep Rakittor, upon the casting circle, burned all the books and discarded all the flattened corpses in Lake Dromm (which greatly increased the population of Coldwater piranhas). Within a few hundred years all was forgotten, until an Orc patrol discovered the Elven ruins. They saw Elven bones everywhere, and where eventually chased away by Elven ghosts or Banshees (they don’t know the difference). Since then the area is kept under control and named Elven Bones. No humanoid dares to enter the ruins at night, but during the day, the recovered all that is and was usable to them. No traces of the Erewan settlers were visible, except their flat broken bones, lying in the midst of the ancient ruins. Upon this 350 or so high ridge are several caves. From far away visible, but not what lurks within. This sandstone layer is a remnant of the past, when the ancient Vesubian River, or Spring Thawing Ice sheets further north, caused floods millennia ago, far, far before the era of Blackmoor. When the area was slowly raised by the 1700 BC disaster water coming from the new and higher mountains seeped in the rock and eroded passages, together these passages became pillared caves. Now that the area is thus high, not much water will pass anymore, but it gives those within a very nice vantage point on the lower areas, which includes the Trintan-Corunglain Pass through the Broken Lands, up to several miles before they need to cross the Vesubian River. Mirror signals will be sent to lower troops and an attack on the passing caravan will be imminent. The orcs are not clever enough that when they see the signals, someone else could too, often the caravans are warned when seeing flashes of light coming from the “Hills have eyes”. Casters cast Freezing Hands on their outstretched fingertips to make them shoot forth 5-foot-long frosts blasts in a 120-degree arc in front of them. Any creatures caught in the blast suffer damage: 1d3+1 hp per level of the caster. Successful saving throws mean the spell inflicted only half damage. Liquids will be mostly destroyed, frozen objects are more fragile (saving throws at -1). Beings resistant against cold take only ½ damage (always round fractions up) and save for none. For normal beings can the damage be reduced to zero if the successful save was accompanied by a protection from cold (or alike) spell. An Icicle a thin foot long sharp shard of ice created and shot by Magic, which inflicts 1d6+1 points of damage to any creature it strikes. After the spell is cast the Icicles will appear next to the Spellcaster and hovers there until the Magic-User causes it to shoot. When shot it will automatically hit any visible target. The missile will has a solid form when shot or thrown and therefore can be touched, but this person will contract all damage without being able to lessen this damage by armor value, in effect any armoured glove will be pierced by the ice even if solid material (iron, steel, stone, etc.). An Icicle never misses its target and the target only gets a save if protected by an active Protection Spell. It will move with the Spellcaster until shot or the duration ends. For every 5 levels of the caster, 2 more Icicles are created by the same spell Thus a 6th level Magic user may create 3 icicles. The Icicles may be shot at different Targets. See table. The damaged will be lowered with ½ the Armor Value under normal circumstances (minimum damage per missile 1). Each icicle will leave 10 oz. of water when melted; this water is 100% pure and therefore can’t be used to drink without the same risk of being poisoned as drinking salt water. The effect will be: more thirst and severe dehydration, no natural, nor Magical healing will be possible until this poisoning will be removed or healed. A bit of sand or even minute amounts of salt can make this water drinkable. This spell creates a pillar or block of ice radiating a cold blueish light 30’ in diameter. If the spell can’t be cast on an object such as a coin, Ice Light will cancel a Darkness Spell if cast within range of it (But will itself be cancelled by a Darkness Spell). This spell can’t be used offensively, but when created in Darkness suddenly it can cause blindness when the saving throw fails, until cancelled, or until the duration ends. A blinded creature attacks with a penalty of -6 on attack rolls, a -4 on all saving throws and a + 4 penalty to his Armor Class for the duration of the blindness. His movement will be reduced to one third normal if unguided, if guided to two third normal. This Ice pillar is 1 inch per level of the catere in diameter and has a height of 9 feet always. The ice block is measured 1 inch on each side per level of the caster. The ice has a weight of 6 +1 cn per level of the caster and can easily be carried away; this ice acts as normal ice in all circumstances. When the spell is ended, or negated the ice will be evaporated. No residue will remain. The ice is solid and can also be used as step, also will this ice float as any normal ice on water and could be used as a life raft for the shipwrecked. In fact this spell is changed a little bit when encased in a scroll or item enchantment. This way it will create a ring, instead of a Pillar, of 9 feet circumference. The light can be seen in the dark from up to 1 mile distance. The ice will be destroyed rapidly if coming in direct contact with fire or heat (as Lava, Fire spells etc. ), without causing steam. This spell creates out of coldness a small slender dagger made of ice with the Strength of steel. The handle will be covered with fur from some unknown cold based creature (possible a White Fang) so that the caster can hold the weapon without sustaining any cold damage. The dagger will be as a normal dagger in all respects, except that it will bring an extra cold damage to the creatures with liquids inside them(like blood), except when they are immune against cold. The dagger will slowly cease to exists if exposed to temperatures over 40 degrees Fahrenheit, and any fire (including a Fireball spell) will instantly destroy it. This spell will give no extra damage to any Undead or Frost based creatures. The Great Orcish Fortress Udhgar, located at a strange rock outcropping was originally an Aengmor Elven city which name has not been recovered, which was originally settled a 10 miles away from the Old Vesubian river. When the mountains rose, they also uplifted this section of the city, destroying the rest around it. Centuries of erosion and plunder removed almost all Elven traces. This fortress has basically 4 levels; “The Roof”; training settlements and battlements on top, here orcs train daily in rapid assaults on settlement. Thar, as being extremely intelligent for an Orc, learned this technique in his slave time in Thyatis. Discovering the old Aengmor Elven ruins he found a great use for it. Not only are the remains sturdy battlements, but also a great area of exercise. Almost any Orcish attack form can be practised here. There are archery ranges, assault areas, multi-level arena grounds, trap testing areas, etc. A roughly 500 to 800 feet lower level with carved and cut rock caves accessible by a small walkway and a stairway from below. It is called “The Middle”. Deep inside are stairways leading up and down. This seemingly luxury area, has doors and windows, but no corner is straight and no opening the same, one is an arch the other a house, and this level is actually roughly four subdivided into four levels of 5-10 feet in height. Then the Third level is at 5925’ (ground level). Here goes the single outside stairway up to the Middle. Large side caves with huge dwarven styled (or stolen??) doors hold the great warmachines of Thar. Deep within there are several arches and stairways and tunnels leading up and down. The area itself are six roughly 200’diameter half dome caves (the floor has been very long ago been flooded with debris, and now rock hard, giving a perfect floor. The caves are workplace too, and the sometimes visiting (or hired) Dragon resides here. There are wooden walkways all along the ceilings, connecting the various caves by tunnels and walkway. It is name “The Entry”. 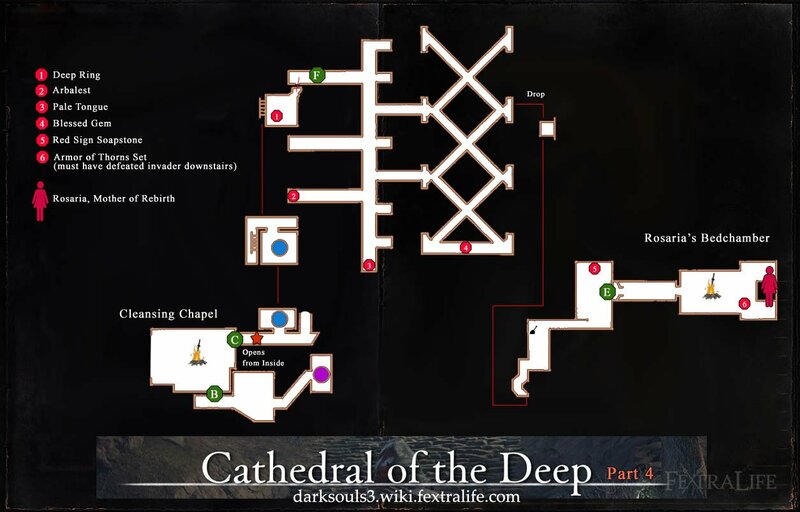 The fourth and lowest level is “The Base” where most soldiers live if not working or training elsewhere in the compound, it gives easy access to Lower Orcus Rex, and there are some stairways leading up. This area is actually three long tunnels with caves dug out on all sides. Walkways, ropes, bridges connect either side or the floor. The area is alive and vivid, and any kind of humanoid can be found here. The region of Orcus Rex is the one region you could truly call THE Broken Lands. The Sandstone and Limestone underground, pushed up by the geological forces from below, broken up, and torn apart by the shifting powers. Connecting layers were broken, twisted, and altered in height to the area beside it. Then erosion and vegetation, continued to alter the region. Rain and snow accumulated in the mountains collected together in small rivulets of water, combining into brooks, creaks, streams and finally into the River that returned(which on itself is the Old Vesubian River, changing direction of flow due the changing altitudes). All this water functioned like a sharp knife. Slowly steadily cutting into the cracks between all the areas of broken land, crawling forward, then freezing in winter, expanding the crack a wee bit more with each frost, and with each thaw, crawling a bit further. Slowly the sand- and lime-stone gave way. Crevices became cracks, very deep cracks, and these cracks became gulleys, and with the continued erosion these gulleys became canyons or small ravines. Several hundreds of feet in altitude difference between the surface and the bottom of the canyon, affected the direction of travel in this region. The area is so difficult to traverse; no straight line can be made, and the amount of distance to cover going from A to B is mostly twice as much as a bird does. At the same time, the Orcs (and other Humanoids too) take advantage of the area. As the top of the areas are rarely accessed by foreigners (the mostly follow the easier river paths), attacking from above with missile weapons, or rapidly retreating after each attack. The orcs know this area thus well, they can traverse it as normal Broken Lands (instead double the time for equal distance than foreigners would do). No area for a foreigner to be found in. The Waterpass is a deep gulley (canyon to become) dug into the ground by two creeks north if Nyarhtor. It has a width of 2 to 4 feet at most and twists and turns every 10 yards or so. At the same time a steady flow of water covers the floor making it very muddy and slippery. Very difficult to find on the surface (as there are more cracks), this one opens up on the River that Returns, but this goes so unnoticed, as the tall grass hides the incoming water and the rough rock hides the crevice. Only when water is abundant (after a Thunderstorm or heavy rain, mostly spring or autumn) the water comes in violently and quickly. Every Orc Knows that it is deadly to remain in a crack when the rain starts to fall and more rain comes from the mountains. The water can come thus quickly, it comes in a wave (10 Turns –intensity roll rain) after the rain started. This wave will cause 1d8 impact, then pull any non-attached object or person in the wave, giving it 1d8-AV impact damage each round, and the victim must make drowning checks as if exerting, if he fails he dies, and is often located dead somewhere else in the gulley or in front of it, up to 1 mile further downstream for each hour the rain lasted. The same damages are in the canyons, but the wave is less powerful due the width of the canyon. It only floods and thus damages those in the creek or stream or its direct vicinity, which triples in depth and width. (Normal creaks and streams are 1d4 x 10 feet wide and 1d6 x 3 feet deep). As being unhindered by rock sides, flown bodies or objects will be flushed 4 miles for each hour the rain lasted, downstream. Floating objects double these numbers, and thus mostly become lost, until an Orc finds it and decides in using/owning it. A note to Lycanthropy and Humanoids. According the Rules Cyclopedia Lycantropy is deadly for all humanoids and demihumans alike. However in gazetter 10 (and some other sources, things were mentioned cotradicting this. Here a list of which Humanoid can be affected by which Lycanthropy. If it can't be affected by that version it is still deadly to be infected. A lycanthrope is immune to all other versions of lycanthropy!! Goblins following Wogar are altered thus they are able to contract Werewolf Lycanthropy. Orcs of all subspecies are naturally affected by Devilswine or Boar Lycanthropy. Bugbears are altered (by an unknown Neutral immortal) if faithful to be affected by Werebear Lycanthropy and become neutral. Some kobolds far away on the western coast of Brun are altered by their Immortal to contract Werebat Lycanthropy. All other Lycanthropic forms are still deadly to any humanoid. This includes also all humanoids not being affected by the above forms of Lycanthropy without the alterations. It may be possible a Humanoid Immortal desires to lift this vulnerability and prevent death, but these should be rare and must be fitting the humanoid species. It would be impossible to accept such a disease and change the humanoid’s basic build-up. Common Lycanthropic forms include; Werewolf, Wereboar, Werebat, Devilswine, Werebear, Wererat, Greater Wererat, Werefox, Weretigre. Uncommon Lycanthropic forms include; Weredog, Werehawk, Wereseal, Wereraven, Wereshark, Weredeer, Werelion, Weresealion, Polarwerebear, etc.. Especially Uncommon Lycanthropic forms are rare, and even rarer to have a link to any known Humanoid race. As Lycanthropes are rare on humans, it should be much rarer on Humanoids. Another interesting area (source; Fanware) in the Crooked Hills of Kol. The Crooked Hills, as the region of Kol is geologically named, has several large volcanic clumps, or bombs when the great volcano of Oenkmar exploded and violently bombarded the area for decades since 1700 BC, until it died out. All these features eroded in time, and a few of these irregular shaped rocks have now specific features and/or were used specifically in the ages following. The first has an almost divine nature; Mother and a Basket.http://3.bp.blogspot.com/-rKXdN-Uox5Y/U ... k+Utah.jpg And some unknown Immortal responded to the given reactions. 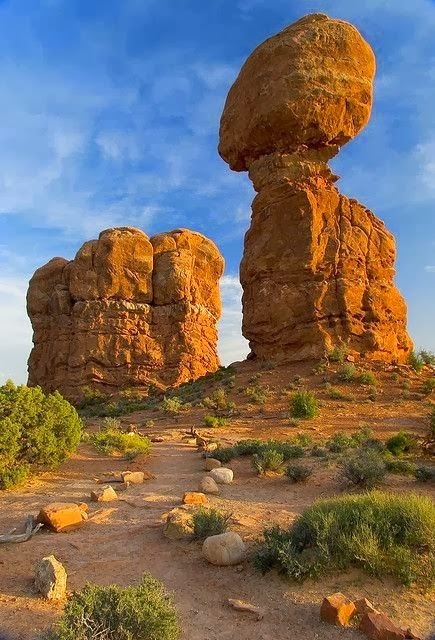 The erosion shaped a peculiar rock formation. The largest resemble vaguely a humanoid figure; with a large head and a somewhat sloughing body. There are even corners visible what could be seen as shoulders. The other, smaller one is roundish and has a depression on top (often filled with rain water unless that has been evaporated); this is called “The Basket”. Pregnant kobolds go here with the guidance of Kobold Shaman/midwife, to enable a good birth later. Any pregnant creature fulfilling the ritual (bathing in the water of the basket) is granted a special spell by the Immortal to be cast at will by the pregnant creature if pregnancy begins (the Green spell). The shamans, Druids, Shamani, Healers and clerics of any race, or faith all gain the three other spells if memorizing spells within 500 feet distance, extra to the normal spells chosen/capable of casting by Immortal agreement. Attacking a midwife, or mother in labor is not accepted by any, and your Immortal will dislike it, the "Mother"Immortal even more, and may act upon it. All over Mystara there are more of these magical mystical symbols of Motherhood and Pregnancy, all with the same effect. If specifically requesting any of these spells, within the area of effect, they are always granted. [color=#004000][b]Summon Midwife[/b][/color]|| [b]Detect Pregnancy[/b]| [b]Prevent Nausea[/b]| [b]Assist Labor & Birth [/b] [color=#004000]1[/color]|	[b]Level[/b] |	1|	1 (Reversible)|	2 [color=#004000]30 miles[/color]|	[b]Range:[/b]| Touch baby belly|	Touch|	Touch [color=#004000]none[/color]|	[b]Duration:[/b]| 1 round/level|	6 turns/level|	none [color=#004000]1[/color]|	[b]Casting Time:[/b]| 1|	1|	2 [color=#004000]1 creature[/color]|	[b]Area of Effect:[/b]| 1 creature|	1 creature|	1 creature [color=#004000]None[/color]|	[b]Save:[/b] |	None|	None|	None [color=#004000]None[/color]|	[b]Components[/b]|	None|	None|	boiling hot water and towels [color=#004000]This spell will call the nearest midwife of any race. The midwife will get the summons. She is under no obligation to respond to the summons, but very few midwifes will ignore it unless unfortunate circumstances prevail, and they will help regardless of race, faith or other sociological barriers. As any race has midwives, there is always one nearby, who will come walking/horse/magic ASAP. She will know which stage of labor the women is in. [/color]|	[b]Description[/b]|This spell enables the caster to detect pregnancy in any creature. The caster will also know the day of conception, stage of pregnancy, estimated day of birth, and gender of child.|	This spell will prevent the woman from getting nausea for the duration of the spell. The reverse of this spell will cause nausea to the victim, male or female. |This spell has multiple functions to assist the mother in labor and birth: Epidural - Produces a numbing of the lower back and pelvis to reduce stress on the mother during labor. Push - Assists mother in pushing the child out. Will cut the time of labor by 1d4 hours. Turn Baby - Will position the child correctly during labor for proper birth. The second is even weirder. It resembles a stone half arch of 5-6’thick, 15’ wide and somewhat over 30 feet long, ending mid air. This object bears various names and stories how it came to be. To one it is the gargantuan claw of an Earth Elemental slain or petrified on the moment it was doing a violent strike upon a heroic figure (Kobolds), or it is the magical sculpture of a great sorcerer (Hill Giants), or---and this one has the best merits—is the bridge. (Gnolls) But actually neither prevents the other from being true too. Whatever the origin, or cause, the structure has a great magical power to be released only on the night of the Full Moon, if the Moon is visible and 1 pint of blood is sacrificed on to of the structure, and a Wizard or Wokani uses the secret ritual verbal and somatic components. If all these circumstances are met, a portal will open on the dead end of the arch enabling those desiring to pass to go where they desire (Only on Mystara, in this Plane, Time and Reality). It is a Teleport Spell that functions like a gate (actually it is both; a spell gone wrong during experimenting, of which the final stage can be repeated if the right circumstances are met—the original caster perished when creating this spell). A wizard viewing and knowing either one or both of these spells will recognize the verbal and somatic components. The vortex gate remains open for 1d6 Turns, and then flickers for 1d6 rounds until it collapses fully on both sides. The gate vortex can be accessed on both ends as long as open. Kobolds use this to loot and plunder far far away. The handicap is that the caster must have at least once physically been at the intended location. Unlike teleport you do not materialize on the other end, you pass through like stepping through a window. Keep in mind DM to check weather, and time the Full Moon is up during casting. Last edited by Robin on Sat Oct 08, 2016 5:59 pm, edited 4 times in total. The Mother Immortal is a recurring case in many fantasy sources. On Mystara I would suggest (as per HW Milenia) Vanya, but my personal feeling goes more to Mother Nature (Ordana) or Mother Earth(Terra). Clear powerful female immortals desiring to enhance propagation. Maybe it could even be all of them in a conjoined effort. The latest update of the Eastern Half of the Broken Lands 1 mile hex map. It may be that some minor changes will come, but in fact it is 99.01% finished. I tried to update it on Deviantart but suffered problems. I can't see it there myself namely.strange. Can it be downloaded there as normal? This one had no problems in uploading/viewing btw....only the Broken Lands map. But could you see it if you use the dowload button (and enlarge it by clicking)? i have requested help from deviantart support to resolve this, but i do not know if it is possible or how long it will take. No, this time not even by enlarging it as happened before..
Sturm wrote: No, this time not even by enlarging it as happened before..
As Deviantart take a while to respond only this link will be functional for sure. even if the picture seems not being there, enlarging it by clicking on it, or dowloading it with the green button right works fine. sorry to all for the inconvience. lets hope it will be resolved asap. My attempt through my blog together with Google Docs will work...I hope. Checking and adding altitudes on both West maps. Adding some minor details on both West maps. Restoring some minor flaws on both West maps. Adding Crystal Growth, monster Lairs, Magic Locations, where needed. Just saw the map for myself and I must it is another great job. As a fan I have to say all the work you put into your maps is greatly appreciated. Demnwlf wrote: Just saw the map for myself and I must it is another great job. As a fan I have to say all the work you put into your maps is greatly appreciated. Those are the words of gratitude, I enjoy, I need, and make me feel my work is good and welcome. Hope you'll like the two western sections too, I am currently working on. Without you and all contributors, players, DM's,scientists, friends; this giganormous work could never reached this point. Although also busy with my Blog preparations, Threshold Proofreading, my secret project, and the section further West where the Great Crater will eventually come to be according to canon, for Micky's work there.....I also succeeded to make some more minor improvement to the Broken Lands before meteor map. Again if you see only white either use the download button right or click on it to enlarge . Soon with micky's help (thank fully he is back )...The Glantrian sections there will be further detailed in description. Two major magical locations came to be. 1 a very large region North of Soth-Kabree. Named; The empathy of Air..This region magically improves air magic like Flying, feaatherfall, telekinesis, Levitate and Floating disc. The natural Flight will also be increased in improving the Manuevering Factor by 1 step. The Magic version will have a double duration if cast within the region, have a 25% succes on learning that spell, but the downside is that those affected will be less offensive and tend to prefer to flee more than before (Morale -3!!). Only natual flyers will be immune to this side effect. I am drawn in with our beloved Micky in creating the 1 mile map of the region of the Silver Sierras where later the meteor will impact. what we came up with thus far. If any of you have extra input, please do give.